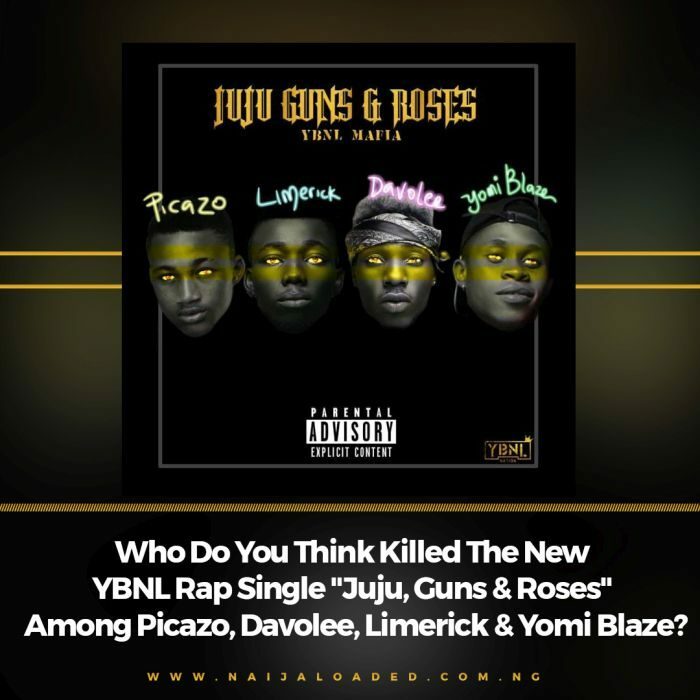 Who Do You Think Killed The New YBNL Rap Single “Juju, Guns & Roses” Among Picazo, Davolee, Limerick & Yomi Blaze? I believe at this time, we should have all listened to the eccentric rap single of the year tittled “Juju, Guns & Roses” that was released under the stable of YBNL. The single gave us a very good insight about the futuristic competency of the newly signed and already existing artistes under the imprint of the label. Davolee gave us nothing but a mega flows, and Picazo didn’t also relent in the killing of the cypher. Yomi Blaze was the most hyped act in that single due to his machine gun flows, and the Edo boy, Limerick doesn’t as well dull himself in dropping his own viper flows in the new rap mega single. They all significantly did well in the single, but no matter how massive they all have inputed their rap prowess, one rapper will have sure killed it more than the other in your own discretion. Which Of The YBNL Rapper, Do You Think Killed Juju, Guns & Roses?